What to Look for When Buying a Pooper Scooper? 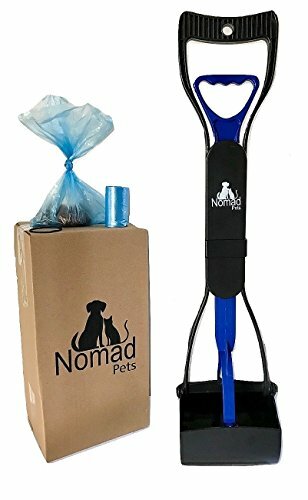 Should I Buy a Dog Pooper Scooper? Taking your dog out to the park or anywhere out with you is a beautiful thing. Having the company of our fur babies at all times is something pet parents enjoy. What we often don’t think about is the mess that entails. Picking up after your pet isn’t the most pleasant thing in the world. Some of us might have forgotten poop bags or tissues back in the car, or I know I’ve accidentally touched the poop because I didn’t have enough tissues on me. Pooper Scoopers are a godsend for those who dislike picking up after their pets with their hands. The right pooper scooper can give you a hands-free option to clean up after your pets. 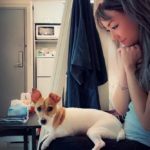 There are tons of options out there, as there are with any doggy item, so we’ve compiled a list again to help you sort through all the choices. This poop scooper can come in a complete package with everything you need to get started in the waste removal process. It includes the pooper scooper, 2 rolls of waste bags and a waste bag holder shaped like a bone! The non-stick plastic allows you to slide the poop into the trash bag with no sticky residue. Picking up after your dog has never been this easy! 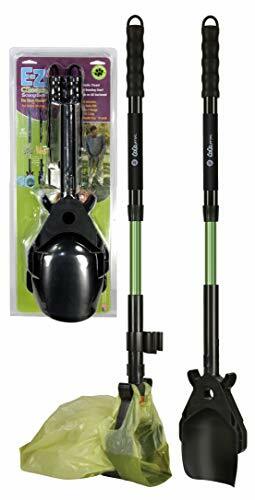 The Bodhi Dog pooper scooper is longer than their competitors, which gives you more reach and puts less strain on your back. The ergonomic finger slots and large bucket scoop makes sure the poop has nowhere to go once it gets its teeth around it. Why We Like It – If by any chance you are not in love with Bodhi Dog’s pooper scooper, they will give you a full, no questions asked refund. That’s how confident they are in their product! This scooper would really make a great gift for dog owners! This resembles a rake we would use to pick up leaves. It might look like a simple design but does the job right. It picks up waste on grassy areas without clutching any unwanted leaves or gunk at the same time. You aim for the poop and that’s all you’ll get in the teeth of the rake. The non-slip rubber grip makes it easy on your wrist, perfect for backyard use! Maintaining a clean home can be challenging, and you don’t want to be washing your hands every time you pick up after your pup. This is the perfect rake for picking up pee pads, diapers, and other toilet training aids! Why We Like It – The teeth of this rake design pooper scooper are widely set, which works best in grassy and sandy areas. Just by looking at the design, you can already tell this pooper scooper is a heavy-duty and very convenient waste scooper. The jagged teeth make it ideal for scooping waste from grass and gravel surfaces. Take Dogit Jawz along with you on everyday walks, cleaning your backyard or even when traveling! This uniquely designed handle allows for easy one-handed use. The handle is spring loaded, which enables easy use in one simple motion. No longer do you need to get down on your knees and pick up after your pooch. Simply whip out this convenient design and grab the poop in one easy swoop. Why We Like It – The pooper scooper itself needs to be lightweight and made of easy to clean materials. Simply rinse the scoop end after use and it’s spick and span again. What’s convenient about this design is it hooks easily onto your dog’s leash. You won’t have to carry it or accidentally leave it behind. This pooper scooper has an integrated waste bag compartment to store any standard size roll. Don’t let its small size fool you, the backside adjusts so you can fit any amount or size of poop in without using your hands! There are different sizes to choose from depending on the size of your pet. 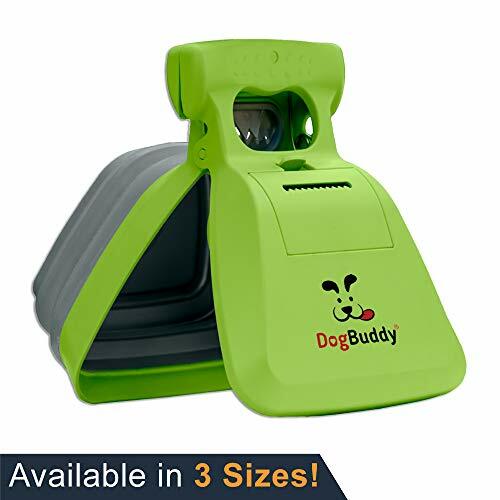 If for any reason you are not amazed by this product, DogBuddy has a money back guarantee to put a smile back on your face. Why We Liked It – Other than the different sizes, there are also three different colors to choose from. It can be a real headache to forget these poop bags at home, but with the easy clip-on design, that won’t happen anymore! Here is a design we all know how to use. Resembling a broom and dustpan, the durable and rotating bin allows for a quick pick-up for the waste of any size. 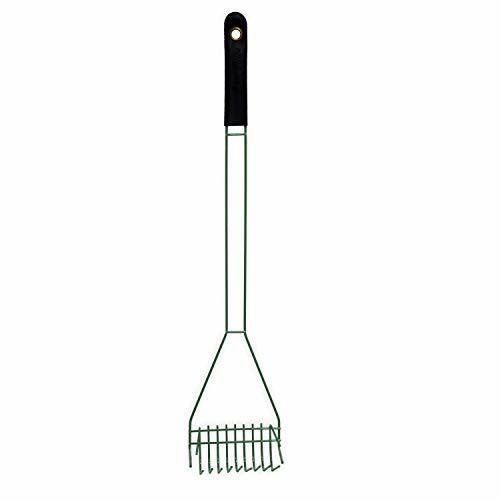 For the poops on grass, gravel, or pavement, use the plastic rake for gentle assistance. 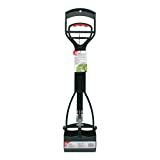 The lightweight handle extends up to 32 inches, which gives pet parents an easier time when picking up after their pooches. On either side of the dust bin are hooked to secure Arm & Hammer odor-control waste bags which make cleanup even easier. 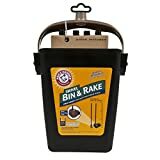 It looks like a cumbersome design, but in reality, the rake and bin handle snap together for easy storage. Why We Like It – This pooper scooper and rake are made of smooth and durable plastic that is easy to clean and don’t retain odor. Simply give them a quick rinse after use. What’s most important with pooper scoopers is to be lightweight and easy to handle. Nature’s Miracle poop scoop is made with lightweight non-stick plastic. It also has an added antimicrobial product protection which controls odor caused by bacteria. Coming in two different sizes to suit your needs, the easy to use rubber grip make picking up pet waste easier than ever! Try this pooper scooper from Nature’s Miracle on any surface and pick up waste in one easy and swift motion. 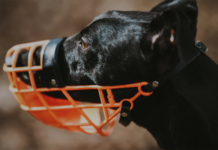 Why We Like It – A very sturdy product, with springs that have enough tension to close tightly around your dog’s waste without missing any bits or pieces. Nothing is more annoying than trying to pick up after your dog and realizing you missed a piece. Fear no more! The strong and serrated teeth of this non-stick plastic bucket will close tightly around any load of poop. The dual-recoil tension springs will give you control over scooping on any surface without accidentally smearing or smooshing the poop. 24 inches in length means less bending and no more back pain! It’s lightweight and easy to use, giving you an ideal tool for this unpleasant chore. After a day on the job of waste pick-up, just give the shovel a quick rinse and you’re done! Why We Like It – Nomad Pets have upgraded their design to include a rubber band that secures the waste bag! No more worrying about the bag slipping off while you’re cleaning up! For those of you with big pups who are not convinced by the versatility of the previous models, this jumbo scooper is the one for you! This scooper extends to 28 inches and is constructed from high-quality materials, it’s built to last. Even for the biggest messes, you can imagine, this large and powerful jaw clamp can handle it! The large jaw and serrated teeth allow you to retrieve waste from any sort of ground in one scoop without missing any of it! This is the perfect design for all sizes and heights. 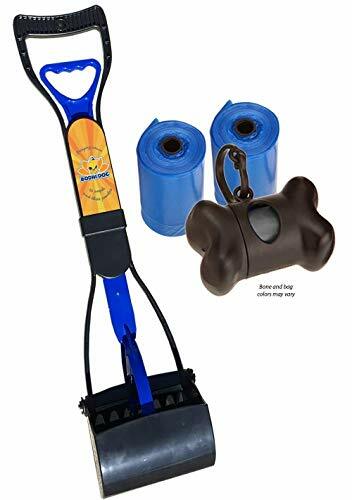 Your kid won’t be able to get out of cleaning up after the dog and he wouldn’t even want to with this easy to use pooper scooper! Why We Like It – Suitable for dogs of any size because we know even small dogs can make big messes. Give yourself a break with this jumbo pooper scooper guaranteed not to leave any pieces behind. This is an option from Arm & Hammer that allows easy pick-up with one hand! You won’t look like a hunchback anymore with this 27-inch claw scoop. The flat bottom is able to sit upright and against a wall when it’s not in use. Store it in your broom closet with other cleaning supplies. The claw scoop is made to be sturdy and works well with any surface. Turn the unpleasant chore of picking up poop into a stress-free and convenient effort. Easy to use, just simply squeeze the inner handle to open the jaws and release to close them. The expert design of the spacing between the teeth leaves the grass untouched but makes sure the poop is sitting securely inside. Why We Like It – All you need is one hand free when using this poop scoop. 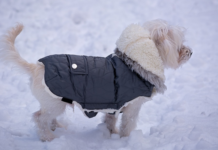 This is great when you have your dog leash in the other hand, and it’s easy to store and keep out of your way as it stands upright on its own. We love bundle deals! If you select the combo it will come with the pooper scooper, E-Z Wedge, and storage clip! Say goodbye to bending over, touching the poop with your hand and smelling the stench! 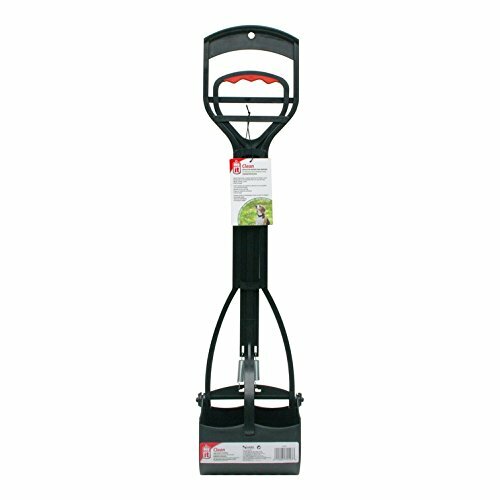 The adjustable aluminum handles stretch from 25 inches to a whopping 36 inches! Any grocery bag or plastic bag will fit the scooper, you can scoop till the bag is full before you have to replace it! Not only is this device good for scooping your pup’s poop, but do you have a raccoon problem? Use this and scoop away the poop! The antimicrobial product protection protects you and the tool. Why We Like It – If you do it just right, there will be no after use cleaning required! Made of aluminum and heavy-duty materials, GoGo Stik provides a 3-year warranty on the off-chance something happens to the scooper. Being a responsible parent and resident of your neighborhood means you clean up after your pet. It can sure be a real pain having to bend over constantly, especially for people who have back problems or even joint issues. Aside from the bodily issues, the mere smell can sometimes send us running. That’s where a pooper scooper comes in. 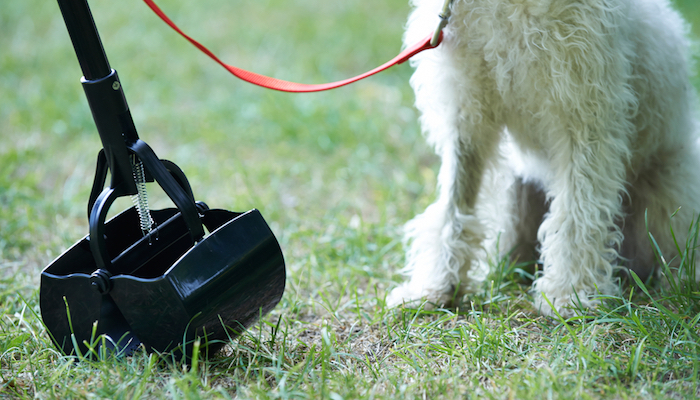 Simply whip out this trusty tool and pick up after your canine absolutely hands-free! 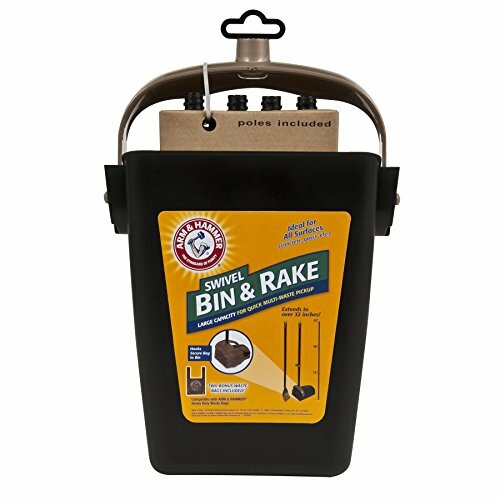 Again with tons of options out there, what makes a good poop scoop? What do you need to look for? Before you let these questions overwhelm you, take a deep breath. Once again we’ve come through for you and have some tips ready. Read on for our tips on buying pooper scoopers. Definitely go with lightweight but sturdy materials. Lightweight does not automatically equate to flimsy. Think about it, when you are walking around, you do not want to be carrying around a heavy and inconvenient poop scoop in your backpack. Having your purse or cell phone in one hand and your dog leash in the other is hard enough. To make things easier on yourself, find a compact and lightweight scooper. Make sure the material is lightweight. Aluminum or some non-rust metal is a great option, other than that, nonstick plastic is a good idea as well. Think of who will be using the pooper scooper the most? If you do not want to designate the job to just one person, find one that is a suitable length for all. Preferably, find a length that doesn’t require you to bend over too much. The right length will give you enough reach and make cleaning up after your pet less uncomfortable. The next thing is to think about where you’ll be using the poop scoop. Would you use it in the house? In your backyard? Out on a walk? Or even bring it with you on vacation? If you are going to use it in your home, a rake or spade style will do just fine. If you plan on using it outside, definitely try investing in one that uses plastic bags and is easily portable. The easy answer is….YES! But before you blindly take my advice, I will back up my suggestion with proven facts. No matter how clean you keep your pet, you are taking a risk when cleaning their poop. Each gram of their waste contains coliform bacteria, most of it being E-coli. Aside from that, tons of different types of worms can live in the feces. I know, gross. To minimize transmission of bacteria and chances of worms contaminating your system, investing in a pooper scooper is a good idea, especially ones with antimicrobial protection. Aside from sanitary factors, scooping up poop improves the aesthetics of your home, your yard, and your neighborhood. Be a responsible pet parent and pick up after your pooch. This is especially important if you have a poop eater on your hands. I’m not sure about your country, but pooper scoopers are required by law in some cities in the States. 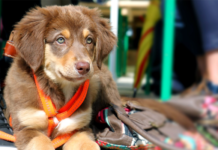 The EPA (Environmental Protection Agency) in America have reclassified dog poop as an environmental pollutant. Do your community a favor and make sure you take the steps to protect the environment from poops. We trust you now have enough information to make an informed decision. 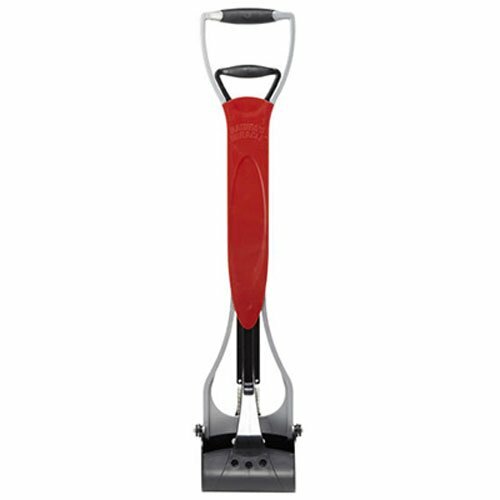 A pooper scooper is necessary for your convenience and the well-being of the environment. No one likes to step in poop, so make sure it doesn’t happen to anyone. 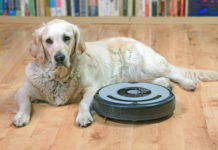 Unfortunately, until the ‘Vapoorizer’ can be invented, you will have to clean up after your pet. Check out the movie Envy (2004) if you’re curious about the reference. With the different kinds of pooper scoopers, this smelly business doesn’t have to be that unpleasant. Good luck scooping! This may seem like a no-brainer, but we’re going to remind you anyway. Make sure you wash your hands after picking up poop or switching out the waste bags. It’s better to scoop and get rid of each pile as it comes rather than accumulating it and giving bacteria the chance to fester. 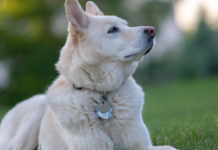 Cleaning up after your pooch can minimize contact with other pests such as flies. Flies are dirty little bugs that can also transmit other diseases to us if we aren’t careful. Next articleWhat Is So Good About Grain-Free Food?